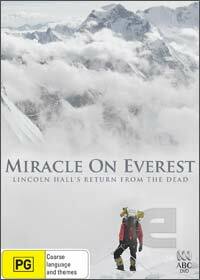 This is the extraordinary story of Lincoln Hall whom his colleagues thought died during his ascent on Mount Everest. Combing actual footage and reenactments, it tells the tale of how Hall's climbing party believed he was dead when in actual fact, his body was in a state of suspended animation due to the harsh climate of Everest. The call was even made to Hall's family that he had died climbing Everest, however as another party found the climber the next day who was alive and well, his first words were "I imagine you're surprised to see me here" as they discovered that the man who was declared dead was thoroughly alive. Director Jennifer Peedom brilliant ties together this incredible tale that is linked beautifully with director of photography Hugh Miller which gives you a real insight into this powerful true story. Gripping from start to finish!